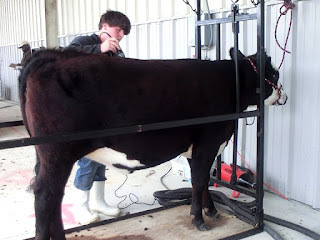 Baton Rouge, LA - The Southern University Agricultural Research and Extension Center’s Maurice Edmond Livestock Arena is teeming with people and activities as youth arrive for the 70th Annual Livestock Show. The next couple of days will be filled with contests among young farmers and ranchers from across the state displaying prime animals and vying for top prizes. This family friendly event kicks off tonight and concludes on Saturday, March 2. For further information, please contact Christie Monroe at 225-771-4350 or Christie_monroe@suagcenter.com. Baton Rouge, LA - The Louisiana Small Farmer Agricultural Leadership Institute held its first training session for the year on February 23. 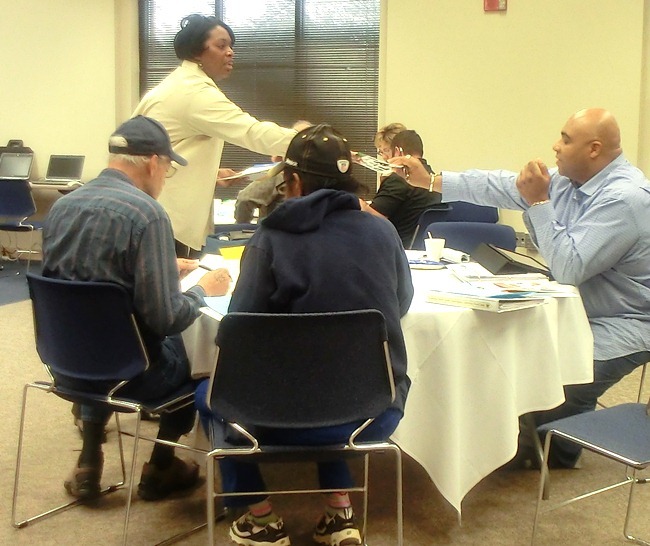 Participants from various parishes gathered to focus on developing leadership skills, while learning about agricultural legal, management and risk issues. The event took place at A. O. Williams Hall, Southern University Ag Center, Baton Rouge. The institute is a course of study designed to guide small, socially disadvantaged, limited resource and/or minority farmers through the transformative process of becoming more successful agricultural entrepreneurs. The overall goal is to promote the sustainability of small family farms through enhanced business management skills and leadership development. The training sessions are designed to be highly interactive and include seminars, video lessons and study tours. At today’s session, topics of discussion included the definition of leadership, and leadership assessment by Dawn Mellion-Patin, Institute Director; leadership characteristic group activity by Tiffany W. Franklin, Extension Associate; overview of agricultural risks by Emily M. King, Outreach Specialist; and understanding farm taxes by John K. Pierre, Esq., Vice Chancellor and Professor, SU Law School. For further detail, contact Dr. Dawn Mellion-Patin at 225-771-3532. Baton Rouge, LA – The Southern University Ag Center held its 19th Annual Black History Quiz Bowl on Thursday, Feb. 21 in A. O. Williams Hall. The Honors College Black team came out on top of the five competing teams. 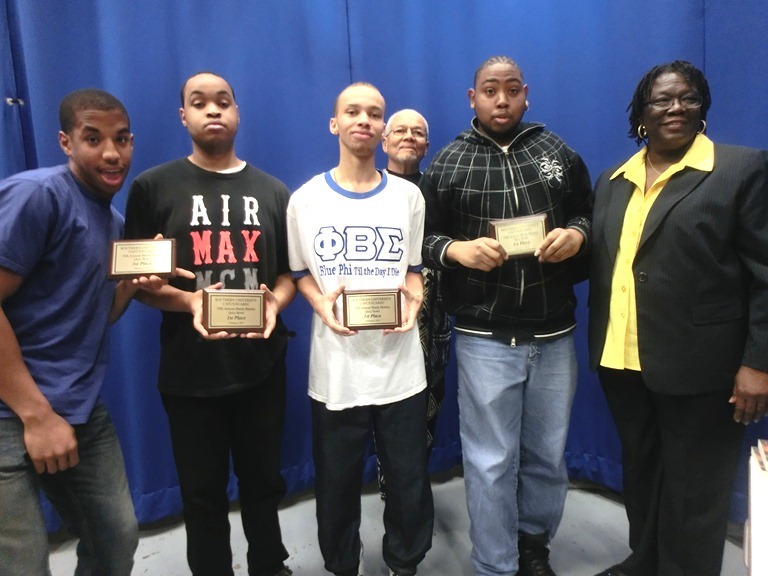 Dr. Gina E. Eubanks, vice chancellor for Extension, presented the plaques to the winners. Dr. Owusu Bandele, Professor Emeritus has been committed to this high school-college educational contest for the past 19 years. 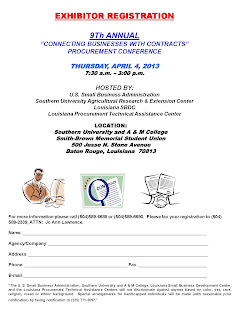 Baton Rouge, LA – The Southern University Agricultural Research and Extension Center will hold its annual "Connecting Businesses with Contracts" Procurement Conference on Thursday, April 4. The event will kick-off with registration at 7:30 a.m. in the Smith-Brown Student Union on the Southern University A&M College campus, 500 Jesse N. Stone Avenue, in Baton Rouge, Louisiana 70813. The conference fosters partnerships between all small businesses including small disadvantaged, woman-owned, veteran-owned, Hubzone, Federal, State and Local Government Agencies and major prime contractors. This event is free and open to all current and potential small business owners, contractors and the public. However, pre-registration is required. The registration deadline for conference participants is March 29. 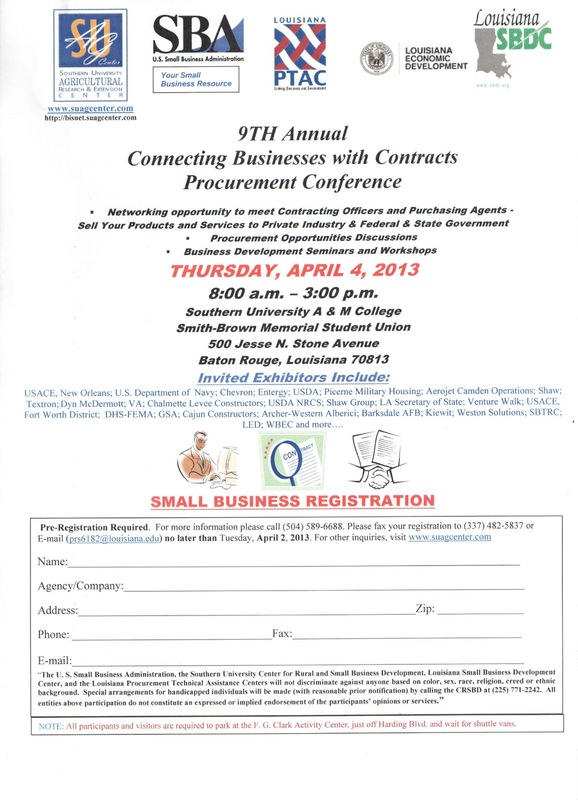 Now in its 9th year, this annual Procurement Conference has become the premier event for small businesses throughout the state of Louisiana. Attendees will receive information on developing effective marketing strategies and capability statements, pricing, contracting with federal, state and local government agencies, methods of financing, licensing laws and consumer protection issues. 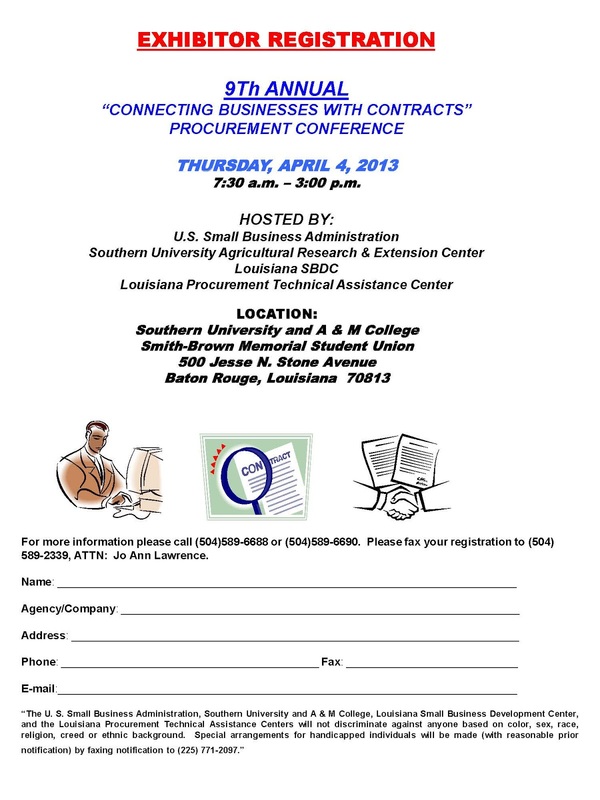 Participants will also be able to network with other small business owners and contracting agents. Representatives from the United States Small Business Administration will be available to discuss Small Business Administration programs and services, loan guarantees, certification process, government contracting opportunities and surety bonds. The Louisiana State Contractors License Board, Louisiana Economic Development and Louisiana Secretary of State’s Office will also be available to answer questions from individuals and business owners. The conference is being hosted by the Center for Rural and Small Business Development at the Southern University Ag Center, the U.S. Small Business Administration, Louisiana Small Business Development Centers of Baton Rouge and Lafayette, Louisiana Economic Development and the Louisiana Procurement Technical Assistance Center. 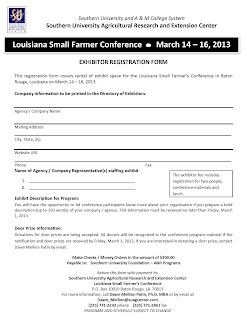 Please fax your participant registration form to (337) 482-1215, ATTN: Peggy Sammons at the Louisiana PTAC before March 29, 2013. Onsite registration will also be available. 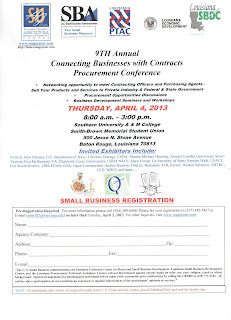 Federal, State, Local Government Agencies and major prime contractors are welcome to serve as exhibitors for the event. 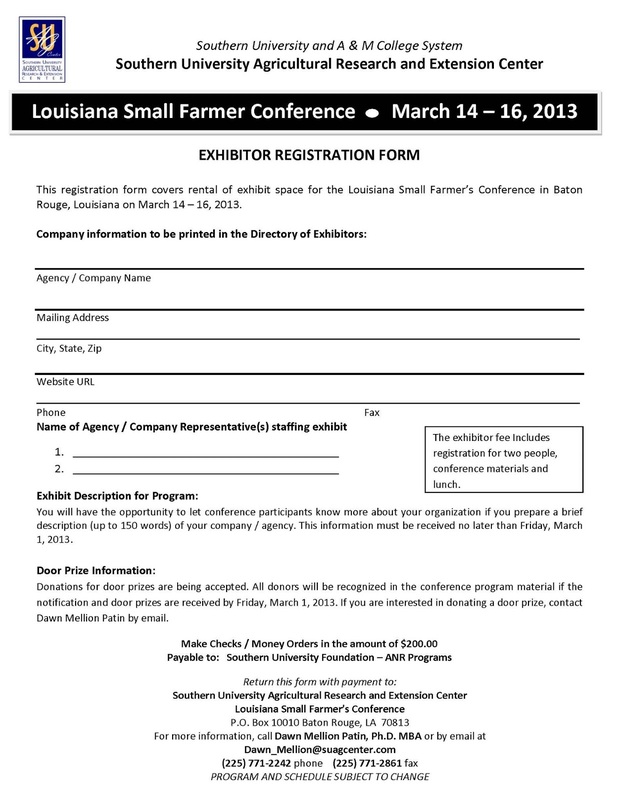 Potential exhibitors are urged to submit an exhibitor registration form to jo.lawrence3@sba.gov or fax to (504) 589-2339, by April 2, 2013. For further detail, please call (504) 589-6688 or (504) 589-6690. To obtain more information or a registration form to serve as a participant or exhibitor, contact Gloria London, Director of the Center for Rural and Small Business Development, at (225) 771-4107; Eual Hall, Business Development Specialist, at (225) 771-4105; or LaKeeshia Giddens, Program Director – E-Learning Center, at (225) 771-2160. LaKeeshia Giddens assisted with this press release. Baton Rouge, LA - Agriculture Secretary Tom Vilsack has reminded Hispanic and women farmers and ranchers who allege discrimination by the USDA in past decades that there are 45 days remaining in the filing period closing March 25, 2013. 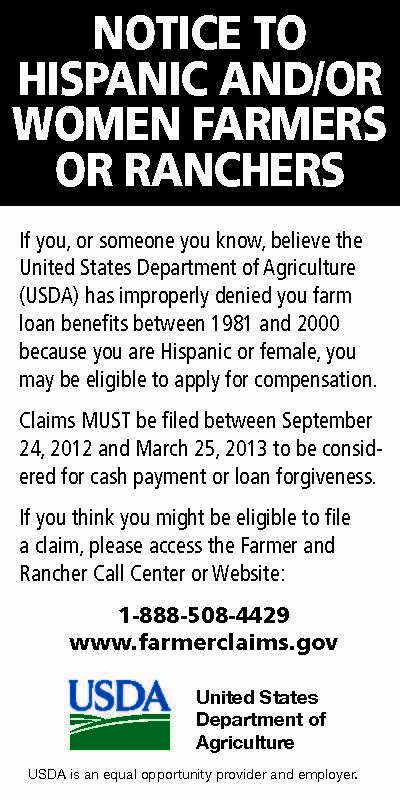 The process offers a voluntary alternative to litigation for each Hispanic or female farmer and rancher who can prove that USDA denied his or her application for loan or loan servicing assistance for discriminatory reasons for certain time periods between 1981 and 2000. As announced in February 2011, the voluntary claims process will make available at least $1.33 billion for cash awards and tax relief payments, plus up to $160 million in farm debt relief, to eligible Hispanic and women farmers and ranchers. There are no filing fees to participate in the program. Call center representatives can be reached at 1-888-508-4429. Claimants may register for a claims package (by calling the number or visiting the website) or may download the forms from the website. All those interested in learning more or receiving information about the claims process and claims packages are encouraged to attend meetings in your communities about the claims process and contact the website at any time or call center telephone number Monday through Friday 9 a.m. to 8 p.m. Eastern Time. 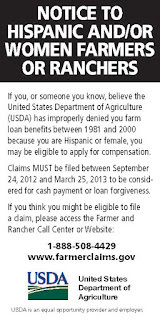 Audio and video public service announcements in English and Spanish from Secretary Vilsack and downloadable print and web banner ads on the Hispanic and women farmer claims process are available online. 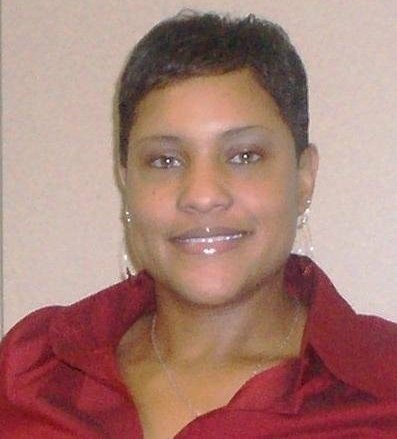 Baton Rouge, LA – SU Ag Center recognizes Mrs. Tiffany Wilkerson-Franklin, Extension Associate, for her contribution to a recent book publication. She co-authored a book chapter entitled, “Private Prisons as Economic Development: Evidence and Implications for Public Policy.” The book is titled “Prison Privatization: The Many Facets of a Controversial Industry,” Volume II: Private Prisons and Private Profit. Other authors include Drs. Leslie Taylor-Grover and Eric Horent, both from the Nelson Mandela School of Public Policy, Southern University A&M College in Baton Rouge, LA. Mrs. Franklin completed the policy implications and the conclusion portions of the aforementioned book chapter. Franklin is currently pursuing her doctorate degree in Public Policy with a concentration in Sustainable Futures. The book’s ISBNs are 10: 0313395713 | and 13: 978-0313395710, available online at Amazon. This three-volume set brings together noted scholars and experts in the field to provide a comprehensive treatment of the subject of privatized prisons in the United States. BATON ROUGE, LA— The Center for Rural and Small Business Development in the Southern University Agricultural Research and Extension Center will hold a free business development seminar on “How to Start a Sustainable Business,” from 10 a.m. to 12 p.m. on Saturday, February 16 inside the E-Learning Center, which will be parked in front of the Ebony Beauty Supply Store, 800 third Street, in Kentwood, La. The seminar is free and open to all current and potential small business owners. In the event that more participants attend the seminar than can be accommodated in the E-Learning Center, the seminar will be moved inside the Ebony Beauty Supply Store. Participants will learn how to start or expand an existing business and receive the forms and applications needed to legally operate a business in the state of Louisiana, as well as, information to ensure that an existing business continues to operate efficiently. To register or for additional information about the Center for Rural and Small Business Development or its E-Learning Center, contact LaKeeshia Giddens at lakeeshia_giddens@suagcenter.com or via phone at 225.771.2160, Eual Hall at eual_hall@suagcenter.com or via phone at 225.771.4105. 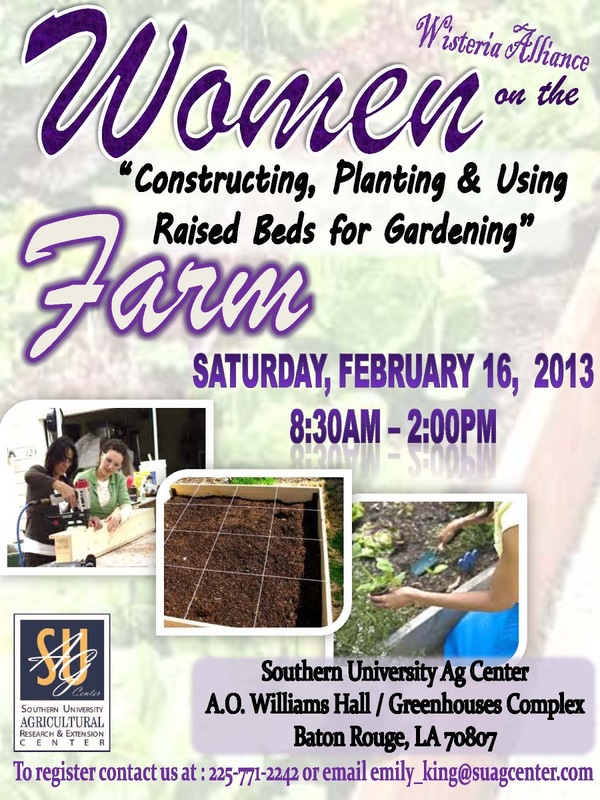 Baton Rouge, LA - Southern University Ag Center will hold a workshop for women on the farm, Saturday, February 16, 2013 in A.O. Williams Hall/Greenhouse Complex, from 8:30 am-2:00 pm. Topics will include constructing, planting and using raised beds for gardens. 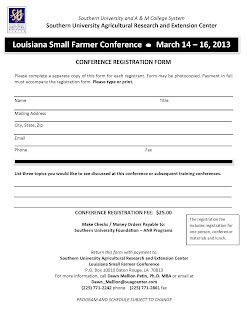 Baton Rouge, La – The SU Ag Center will hold its annual Louisiana Small Farmer Conference, March 14-16, 2013 in A. O Williams Hall, 181 B. A. Little Drive, Baton Rouge, LA 70813. Registration is $25.00 by March 1, 2013. Pre-conference sessions will include grant-writing opportunities. Conference sessions will cover topics such as farm diversification, record keeping, marketing strategies, estate planning and USDA programs. The Louisiana Small Farmer Agricultural Leadership Institute is a course of study specifically designed to guide small, socially disadvantaged, and limited resource farmers through the process of becoming more successful agricultural entrepreneurs. This unique training prepares small farmers to make better decisions on their farms or agricultural operations, while also equipping them with the necessary skills and expertise to assume positions of leadership in the agricultural community. To register or obtain further details, visit us at www.suagcenter.com or call 225-771-2242. 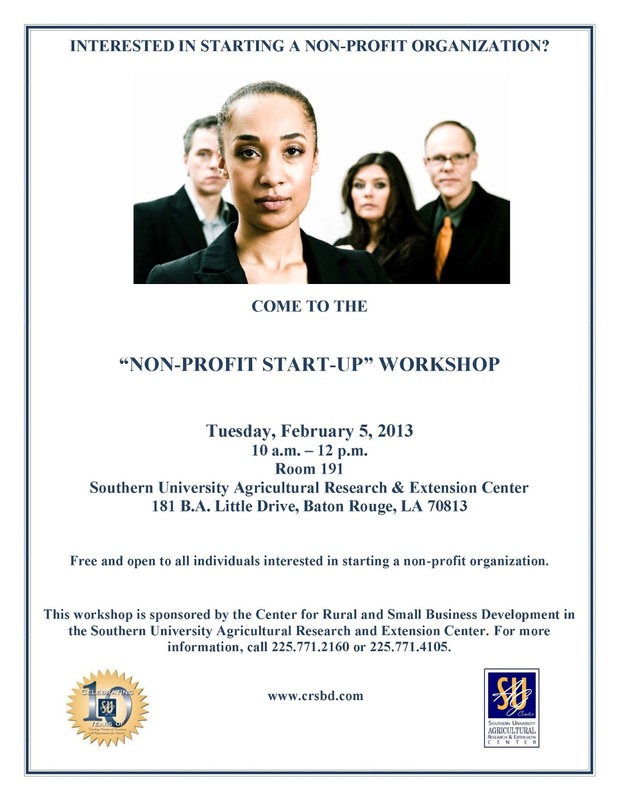 Baton Rouge, LA - The Center for Rural and Small Business Development in the Southern University Agricultural Research and Extension Center will hold a “Non-Profit Start-Up” workshop from 10 a.m. to 12 p.m., Tuesday, February 5 in room 191, A.O. Williams Hall, 181 B. A. Little Drive, in Baton Rouge, LA 70813. Workshop attendees will receive information on how to start a viable, operational non-profit organization, and the steps to receiving 501© 3 tax exempt status. For additional information about the Center for Rural and Small Business Development or its E-Learning Center, contact LaKeeshia Giddens at lakeeshia_giddens@suagcenter.com; 225.771.2160; or Eual Hall at eual_hall@suagcenter.com; 225.771.4105.